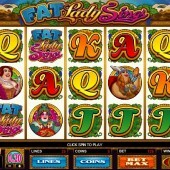 “It ain’t over till the fat lady sings,” goes the famous saying, and if big-boned temptresses belting out arias is your idea of a good evening out, you’ll probably get a kick out of online slot developer Microgaming’s 5 reel, 25 pay-line slot. Fat Lady Sings features a trio of female opera singers, bursting at the seams as they belt out one of the pacier numbers from a Wagner or Verdi masterpiece (the one dressed as a blonde, plaited Valkyrie from Wagner’s Ring Cycle is particularly good). As well as am pastoral J-through-Ace poker symbols, there’s a Fat Lady Sings symbol on the reels, and it acts as the game’s Wild, substituting for all regular symbols other than the Scatter. Five Wilds across the reels awards a 3,000-coin jackpot. Look out for the dramatic Smiling/Frowning Masks Scatter. Three or more of those across the reels triggers a very generous little free spins round, with extra Wilds added, including Stacked Wilds reels 2 and 4. For three Scatters you’ll win five to 15 spins with a 1-5x multiplier, 5 to 20 spins with the same multiplier for hitting four Scatters, and a top whack of 9-30 spins for getting five Scatters in the base game. The same multiplier applies here. Earn up to 5x Multipliers Too! How do you find out what spins and multiplier you’ve won? Here’s the neat bit. On triggering the bonus round you are first presented with several shelves of wine glasses and asked to choose low, medium or high pitch. 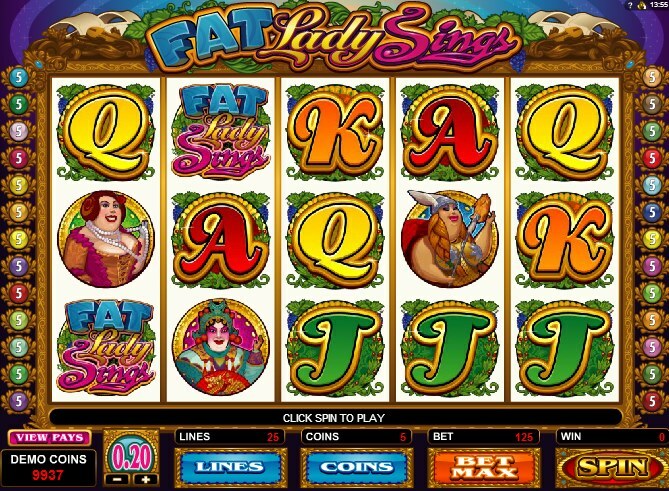 The fat lady sings and breaks a number of glasses to reveal the amount of free spins. The next fat lady sings in order to crack a vase, which reveals a multiplier. Finally, a German opera singer (our favorite little Valkyrie) sings in order to smash a beer glass. Here she’ll reveal a bonus win. With a potential cash-athon resulting from free spins and big multipliers, this slot really delivers highs to rival any from the show-stealing diva on stage. The theme is great, the graphics fun, and the overall feel slick. Microgaming’s lush Oriental-themed slot, Asian Beauty, came instantly to mind when I played this, and is certainly a recommended alternative. Rival Gaming’s fun frolic through opera, Opera Night, however, is also well worth the admission price.